Yesterday afternoon the MIT Corporation Advisory Committee on Shareholder Responsibility met for the first time since 1999 to discuss the issue of divesting from Sudan. President Susan Hockfield reactivated the committee after students and other MIT community members raised concerns about MIT’s investments in mulit-national corporations in Sudan. Elizabeth M. Ogar, vice president for resource development and staff for the committee, said yesterday morning that no decisions would be made at the meeting. Instead, she said, the meeting content consisted of background information and deliberating on the issues. Alan Spoon, the managing general partner of Polaris Venture Partners, is the chairperson of ACSR. 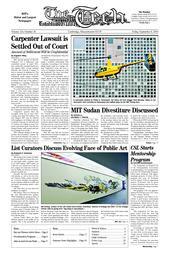 MIT lags behind other preeminent universities on the issue of divestment from Sudan. Harvard, Yale, Stanford, and more recently Princeton have withdrawn their funds earlier this year to protest the violence in Sudan, according to the Daily Princetonian. When asked if MIT feels pressured by the divestiture announcements of the other top schools, Ogar said that Hockfield wants the committee to give careful thought to the issues surrounding divestment from Sudan. Undergraduate Association President Andrew T. Lukmann ’07 said that he and Graduate Student Councila President Eric G. Weese G have been encouraged by the committee to be proactive about soliciting student opinion. Lukmann intends to “send an e-mail to undergraduates to gather opinion on the issue,” hoping for a stance to bring back to the committee. “Student members are enfranchised and opinions will be respected,” Lukmann said. “I feel it is my responsibility to make it an issue that all undergraduates should be aware of,” Lukmann said in reference to the current situation in Sudan. Weese said that though the meeting did not include discussion of exactly what information members are allowed to divulge, he will be happy to meet with anybody who is interested in learning more about the issues surrounding possible divestment from Sudan.